A brief flurry of excitement gripped Cuba and Cuba watchers abroad when the video of a meeting in January 2008, at which students at the University of Computer Science in Havana questioned Ricardo Alarcón, president of the Cuban National Assembly, on government policy in several areas became public knowledge through the BBC (Ravsberg, 2008) and CNN (Darlington, 2008). An article in the newspaper Juventud Rebelde, unusually reproduced the following day in Granma, the organ of Cuba’s Communist Party, scolded foreign media for sensationalizing “the internal debate in Cuban society” (Valiente, 2008). Then, for two days running, the Granma website in turn provided links to government-sponsored videos featuring the students who had spoken in the meeting with Alarcón, one of whom denied reports that he had been detained afterwards and affirmed that his questions had been meant to improve socialism (Granma, 12 and 13 February 2008; Elizalde and Serrano, 2008). Whether by accident or design, the confrontation of young computer science students with a septuagenarian holder of a degree in philosophy and letters projected rather neatly a stereotypic picture of a clash of generations and cultures, in which not even the standard when-I-was-your-age-I-didn’t-have-shoes lecture was missing. Some observers suspected the guiding hand— if not in the whole affair, at least in the leak of the first video—of reform-minded quarters in the government, intent on airing certain subjects already widely talked about in the street, as part of the intricate game of undermining their die-hard opponents—a bit of a refresher of the September-October 2007campaign of Communist Party and mass organization meetings to discuss the country’s problems, following Raúl Castro’s allusion to the need for “structural and conceptual changes” on July 26 that year. Valiente (2008) acknowledged that previous waves, such as the call to be disciplined and exacting at the end of the 1970s, the rectification drive in the 1980s, and the workers’ parliaments in the 1990s, had not been sustained, and that different editorial policies in the media were perhaps also lacking. Quite so. Had the diffusion of the video of the Alarcón meeting not been so highly unusual— had regular public debate of national issues, routinely reported in the media, been daily fare in Cuba in the last half century, the event would have received scant notice anywhere. What makes this episode worth recalling is the complex problem of culture—the amalgam of patterns of behavior, shared values, institutions, laws and customs, including the relationship between governors and governed— that lies at its heart. Some strands of this culture reach far back into Cuba’s history. Some were modified or created in the Castro era and may fade away upon the disappearance of an authoritarian leadership, rendered deaf to advice by the sense of its own superiority, as well as upon a reduction in the sort of ill-considered and incoherent decision-making that has left a trail of initiatives equivalent to a lifetime of one-night stands to relieve hormonal flushes. Deeperlying strands will continue to influence the course of events in greater or lesser degree even after it is no longer felt necessary to protest one’s adherence to Cuba’s brand of socialism in order not to be stigmatized a foreign agent when criticizing governmental policies and practices. Obviously, Cuban culture is a subject far beyond the scope of one paper, even if it were within our competence to discuss many of its facets. Our purpose is merely to point to certain features directly impinging on the economic sphere and that clearly need to be addressed in the pursuit of reform. One of the lessons to be drawn from transition economies across the world is that the liberalization of markets can have unintended consequences without corresponding changes in economic culture and putting in place strong independent institutions to promote its development. Another is that attitudes and habits rooted in a nation’s culture tend to be very slow to change. A financier, a pure economist, a metaphysician of the Revolution, would have said: “Careful! Don’t lower those rentals by one cent, because financially, because economically, because pesos more, pesos less.” Those persons have a peso sign in the head and want the people also to have a peso sign in the head and in the heart. And if we want a people that gets rid of the peso sign in the mind and the heart, then we must also have men who free their thought of the peso sign. In the event, some 8.5 million metric tons of sugar were produced in 1969/70—an all-time record for Cuba, but one achieved at the expense of largely paralyzing other economic activities. The experience triggered a series of what in regime jargon are described as policy rectificaciones (Sarduy Quintanilla et al, 2007) which, according to Castro (1978:111–12), aimed at “the partial recovering of the economic controls” so as “to determine, to the last detail, how much we spend in everything we produce.” In practice, costs remained a minor consideration as long as the Cuban economy enjoyed the support of the Soviet Union and other members of the socialist bloc. “A cent more or less in costs wasn’t decisive when we were paid 30 cents or more per pound [of sugar],” Carlos Lage, a leading member of the government, acknowledged years later (Granma, 8 October 2003). Subsequent changes in data collection and accounting systems did not eradicate the confusion between bureaucracy and necessary record-keeping, particularly in the popular mind. The underrating and debasing of bookkeeping “left its after-effects to this day,” the magazine Bohemia reported in 1999 (quoted in Sarduy Quintanilla et al, 2007). Especially among sugarcane growers, resentment against the close supervision exercised by superior organs helped to sustain the confusion (Royce, 1996:55, 115, 206). Public education campaigns to stimulate greater cost consciousness in the minds of workers have waxed and waned in accordance with the dictates of the regime. For instance, during a brief period around the turn of the millennium a flood of figures issued from official sources on the unit costs of sugar production (Hagelberg and Alvarez, 2005:462). The tap was turned off following the botched restructurings of the industry from 2002 onwards, thereby avoiding the embarrassing disclosure of the financial consequences of an output decline far faster and sharper than is likely to have been matched by reductions in overheads and other expenditures. The sugar production cost figures publicized while the fashion lasted also furnished an example of a frequent failure to assist in the correct interpretation of official statistics by explaining their construction and meaning. In this instance, closer examination indicated that the numbers variously represented either mill costs that valued sugarcane at the price paid by factories to the growers, which in many cases did not cover the farm costs of production, or foreign currency direct expenditures for production inputs, not the total costs. Inherited from early days is an inattention to significant detail, resulting in the creation of economic myths. A classic case is the obliteration of seasonal variations in and progressive inflation of the number of unemployed said to have existed before the Revolution (see Appendix). This metamorphosed the findings of a pre-Revolution survey showing seasonal fluctuations in the number of unemployed ranging between 200,000 in the February-April quarter and 457,000 in August-October into a single figure of 700,000. The actual levels of unemployment before the Revolution were high enough not to need embellishment to score extra political points. 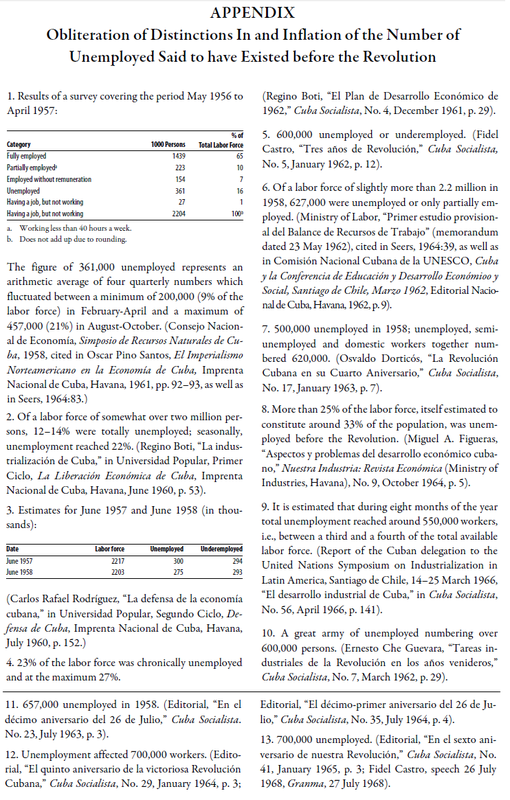 Disregard of the seasonal swings left the authorities unprepared for the appearance of labor shortages in Cuba’s agriculture, particularly during the sugarcane harvest, as early as 1962 in consequence of the institutional and other changes introduced by the revolutionary government (Pollitt and Hagelberg, 1994:548–552). Quantification in official statements runs the gamut from fictional round numbers to spurious precision. Alongside the legend of the workless 700,000 before the Revolution stands the more recent fable of 2 million hectares of sugarcane area said to have existed at the outset of the 2002 restructuring of Cuba’s sugar industry. Initially interpreted to mean the area under cane, the figure was questioned from the start (Hagelberg, 2002:498). Eventually it became clear that it could only refer to the area under sugar ministry oversight, the land actually planted with sugarcane at that point probably extending to less than 1.4 million hectares. In the course of the Special Period, the sugarcane area harvested shrank from an average of 1.44 million hectares in 1989/90–1991/92 to 1.04 million hectares in 2001/02, the last crop before the restructuring (ONE, 2007, Table X.5). 86.7% of the cane will be cut by machine, for which 1,752 chopper harvesters are on hand; also deployed will be 3,801 trucks, 1,322 tractors, 260 locomotives, and 21,384 manual cane cutters. In fact, the percentage of machine-cut cane—to one place behind the decimal point—piled an estimate on to an estimate of the harvestable cane. As for the rest, the ministry could know only the number of locomotives at its disposal. Since Basic Units of Cooperative Production (UBPCs) were now officially classified as non-state along with other types of cooperatives and individual growers, it had even less control of the cane crop and means of getting it to the mills than before. It could have no more than a very rough idea of the available manpower. Just one man more or less, or one laidup piece of equipment, would falsify the numbers. And, indeed, reality soon gave the lie to the claim of preparedness. Within two months, a below-plan milling rate was being blamed on “the late arrival at some factories of essential gear for the harvest (for example, chopper harvesters and tires)” and at one mill, whose start was delayed by almost three weeks for this reason, six to seven harvesters, out of 45, were regularly out of action because of breakdowns, when operations did begin (Varela Pérez, 2008a, 2008b). The official misuse of statistics raises wider issues. Officials in charge of government statistical departments— if not also the journalists who report their utterances— must be presumed to be statistically literate. Dodgy data bearing the fingerprints of political manipulation have the two-sided effect of destroying public trust in the professional integrity of the sources and of betraying the authorities’ low regard for the intelligence of the public—a toxic combination for the successful conduct of the country’s economy. If there are people making demands on government “before informing themselves” or because of “lack of information,” as Raúl Castro told the National Assembly on 24 February 2008, it is essentially a problem of the government’s making. With rare exceptions, the intellectual level of the presentation of domestic economic issues in the officiallycontrolled media has sat strikingly at odds with the vaunted existence of an educated public, in which graduates of universities or similar institutions make up more than 13% of the economically active population (ONE, 2007, Table VI.6). Alone in the field of accountancy, Cuba reportedly had approximately 11,000 practitioners as of early 2003. According to one observer, Cuban auditing controls were, in theory, “superior to those of North America, and heavily emphasized in the education system.” However, “in practice the Cuban accounting systems have historically had significant problems operationalizing the theory of accounting and auditing” (Becker, 2003). Cuba’s economists and accountants are organized in the Asociación Nacional de Economistas y Contadores de Cuba which produces an on-line journal, El Economista de Cuba (http://www.eleconomista.cubaweb.cu/). Rather than a forum for technical discussions of aspects of the island’s economy and accounting standards and practices, however, this turns out to be another ideological tool. A typical number (Year 8, No. 326, 26 March 2008) featured the Reflexiones del Compañero Fidel, articles on the cost of the war in Iraq, the global significance of the high price of oil, the troubled financial state of American and European banks, the “apocalyptic” noises emanating from world capitalism, and tributes to the late Trinidadian economist Lloyd A. Best. However instructive, the failings of capitalism abroad can offer only temporary distraction from the problems at home, as illustrated by the slow progress made in implanting a new business management model in the stony ground of Cuba’s state enterprises. Started experimentally in the second half of the 1980s in businesses run by the armed forces, Perfeccionamiento Empresarial (roughly translatable as Enterprise Improvement) was extended to the civilian sector in 1998. Aimed at raising efficiency and embracing all aspects of management, from accounting and cost control to organization of the work and quality assurance, Perfeccionamiento Empresarial has been a process rather than a discrete event in the life of a business. As such, it perhaps offers a foretaste of the long road to be traveled to implement more than such relatively simple economic reform measures as authorizing the sale of consumer articles previously inaccessible to ordinary people. Almost ten years later, it was still very much a work in progress.7 According to Carlos Lage Dávila, a leading figure in Cuba’s government hierarchy, not yet a third of some 2700 enterprises in the country was incorporated in the system as of mid-2007 (Granma, 30 August 2007). On the whole, the enterprises within the system were said to be performing far better than those without. But their progress was neither uniform nor irreversible—38 businesses having been suspended from the system for deficiencies in accounting and internal control—and it remained an open question whether the gains in efficiency were mainly due to the system or whether the enterprises successfully applying the system were reaping benefits not of their making, if not more robust in the first place. Tellingly, the sectors with the lowest participation were the sugar industry, in which the process was paralyzed for almost two years in the wake of the restructuring, and locally-controlled businesses which do not have the conditions to apply the model (Lee, 2007). Cuba is often called a small country. The island’s dispute with its northern neighbor is portrayed as a geopolitical struggle between David and Goliath. That has boosted Cuban self-esteem and earned Cuba sympathy throughout the world—and all the more because of the bully-boy behavior of the giant. In the economic sense, however, Cuba does not rate as a small country by the yardsticks generally applied. No agreed definition of what constitutes a small country exists, even though much has been written on the economic consequences of the size of nations since an International Economic Association conference on the subject in 1957. But a recent study (Ahlfeld, 2007) reflected predominant opinion in putting the upper population and area boundaries at 1,500,000 inhabitants and 40,000 square kilometers respectively. With a population of about 11,200,000 inhabitants (approximately 7,000,000 in 1960) and an area of roughly 110,000 square kilometers, Cuba lies well above the range on both counts. Looking at the matter through Caribbean eyes, the relative differences in size and population between, say, Barbados (280,000 people on 431 square kilometers) and Cuba are strikingly greater than those between Cuba and the United States. After careful consideration of the evidence from 70 small states and territories, Ahlfeld (2007) concluded that— contrary to conventional theory that associates negative economic consequences with smallness—a country’s size may influence the structure of its economic development process but does not predetermine the result. The perception of Cuba as a small country, rather than the medium-sized country that it is, could not but deflect from the necessary analysis of its specific features and facilitate the adoption of inappropriate policies, such as excessive centralization. While many countries have some common characteristics, no two are exactly alike; each is unique. Attached to Cuba is an extensive narrative of uniqueness. It has long been popularly known as the Pearl of the Antilles (although its uniqueness in this respect is somewhat impaired by the fact that Saint Domingue, today’s Haiti, and Jamaica have been described in the same terms, albeit less frequently). For most of the 20th century it was a leading player on the world sugar market; its nickel deposits are thought to be among the largest in the world; it is famous for the quality of its cigars; it is a source of inspiration to world popular music; and for almost half a century it has been the site of an anti-capitalist revolution on the doorstep of the world’s foremost capitalist power. Whitehead (2003:2–4) lists a whole string of Cuban political deviations from what may be called standard patterns, beginning in the early 19th century. These striking particularities have inspired a preoccupation with the national destino, while also engendering frustration that the promise they are believed to hold has not been fulfilled. Eusebio Leal, the Havana City Historian and director of the restoration program of Old Havana, tapped into a recurring theme in Cuban political rhetoric when he cried “Let us prepare ourselves for the new destiny of our country” before a congress of writers and artists a few weeks after Raúl Castro was confirmed as the country’s president (Granma, 4 April 2008)—leaving it open to surmise some disappointment with the previous regime. Geographical position, rich soils, and the natural intelligence of its inhabitants mean that Cuba is destined to play a magnificent role in history, but it must work to achieve it. . . . The historical destiny of Cuba, on the other hand, has been frustrated, until now, by the corruption and blindness of its rulers. . . .
Cuba must aim—when it has attained the necessary moral strength for it—to unite the wills of the peoples of the Caribbean in order to create the federation of the seven Central American states, with the support of Mexico to the north and Venezuela to the south. That is its destiny. . . . It cannot be the destiny of a country to sell sugar to buy cars. So much for Ricardo and international trade theory. In denouncing corruption, Chibás did at least call attention to a key economic issue: the great costs of corruption for economic growth and development. Idealistic invocations of destino do nothing to elevate a country’s economic culture. Going beyond the indisputable peculiarities of Cuba’s character and history, the continued survival of the Castro regime long after the dismantling of the Berlin Wall has rekindled discussion of the idea of Cuban exceptionalism (Whitehead, 2003; Centeno, 2004; Hoffmann and Whitehead, 2006, 2007).8 Some of the arguments advanced in these papers have been overtaken by subsequent events, evidence of the idea’s vulnerability to revision. Still, a holistic approach to the issue, combining historical, political and economic considerations, sounds a needed caution against facile assumptions regarding the direction in which Cuba perforce must be heading. Logically, by the same token, the determinative question of the sustainability of the Cuban model cannot be answered. Cuba’s particularities may shape the specific operation of fundamental economic laws, but do not add up to sufficient reason to believe it can escape these laws altogether in the longer run. It still remains an open question whether the Cuban model, based on an insistence on following a separate path, will eventually prove capable of survival, or whether in the end it is forced to capitulate by embarking on the economic transition long thought to have been inevitable. To the extent that it rests on agriculture, the state of the domestic sector, among other things, gives the lie to one of the most persistent economic misconceptions: the high fertility of Cuban soils.9 Some justification for the belief in the fecundity of the land may be found in 19th century sugarcane yields, particularly in virgin terrain, which today seem extraordinary, but then were considered normal (Moreno Fraginals, 1978:I, 190–192). By the 1930s, however, such figures were history (Moreno Fraginals, 1978:III, 48). Nevertheless, the idea of a Cuban cornucopia lived on in the special agricultural plans conceived by the Comandante en Jefe, such as the “Havana Green Belt” that was to have supplied the capital’s inhabitants with all manner of products, including coffee and strawberries (Castro Ruz, 1968). Leaving aside the waste of resources because of their failure, the agricultural environment, in fact, has deteriorated over the years, largely owing to poor management, and its restoration will require much time and money. According to the most recent estimates, 75% of Cuba’s farmland is degraded to some degree, about 3 million hectares (45%) are low in fertility, about 4.6 million hectares (69%) are low in organic matter, about 1 million hectares (15%) suffer from salinity problems, and about 2.5 million hectares (37.6%) exhibit medium to severe erosion effects (FAS/USDA, 2008:11). This now is the point of departure for reforms in Cuba’s agriculture. Decades of Fidel Castro’s lectures did little for Cuba’s economic culture, unforgettable as his exposition of the merits of Chinese rice cookers may be. “With the still insufficient debate, presentation and public discussion of the domestic economic difficulties, no other thing is to be expected than the ‘lack of economic culture’ in a great many Cubans,” wrote a Cuban economist in early 2008 in commenting on the expectations and impatience for change expressed in popular meetings (Vidal Alejando, 2008:22). From a different perspective, Salvador Valdés Mesa, general secretary of Cuba’s trade union federation, stressed the need to “raise the economic culture of our members” (Reyes García, 2008).10 Raúl Castro himself, in a statement to the National Assembly at the end of 2007, made the connection between public access to information and the reform process. Referring to the proposals and suggestions made in meetings on the economic and social situation held across the country in September and October 2007, he said that “some opinions reflect lack of information, above all in the economic sphere” (Castro Ruz, 2007). This could hardly have come as a surprise to anyone looking at Cuba’s mass media. For instance, as recently as the end of 2007, the coverage in the leading government organ of the (themselves severely limited) National Assembly proceedings concerning the country’s economic and budgetary performance that year and the projections for the following (Granma, 28 and 29 December 2007) suggested that the governing editorial principle was that expressed on the banner stretched across the wall at a MINAZ seminar on state secrets in the sugar sector in December 1976 with the legend in Spanish: “The protection of state secrets is our contribution to the economy” (ATAC, 36 [1/1977]:22). The animosity of successive US administrations towards the Cuban regime has provided it with fig-leaves front and back: to hide information not even remotely related to national security and to veil its ignorance where it simply does not know. Engrained habits of secrecy and obfuscation will have to go if economic reforms are to be carried out efficiently. The solution of complicated problems, such as the realignment of currency exchange rates, requires the understanding and support of an informed citizenry, not one prone to act on rumor. Agitprop does not make for educated public discussion of national policy issues. Neither does isolated individual opinion formed primarily on the basis of anecdotal personal experience. But, in matters affecting their daily needs, people will understandably trust the evidence of what they can buy locally, for instance, more than official figures of nationwide availabilities, accurate or not. If the authorities genuinely seek intelligent debate, the information presented to the public must be not only reliable but also relevant. The first requisite to nurture a culture conducive to the optimal conduct of the clearly needed reforms of the Cuban economy is public access to all pertinent information, constrained only by the narrowest possible considerations of national security. Obviously, to be useful, the information has to be comprehensible (with data properly defined) and reasonably complete and accurate. The perusal of government statistical publications and academic studies being a small minority sport, their contents have to be processed for wider consumption. This means opening newspapers, radio and television to the contributions of professional economists and other scientists, not excluding views that challenge official orthodoxies. Governmental decision-making is inevitably colored by politics. But the evidence on which decisions are based and which to justify them is presented to the public must be free of the suspicion of political manipulation. Cuba’s economic culture will come of age when there are politically independent institutions to scrutinize what the government says and does, and free to disseminate their findings, when dissenting opinion is seen not as treason but necessary debate, when it is commonly accepted that not every economic or social problem can be solved by administrative fiat or even statute law, and when millenarian dreams of becoming the perfect model are finally replaced by realism, both in respect of the country’s resources and capabilities, and the opportunities open to it in the 21st century world. 2. By late spring 1967—after an effective milling period of 101 days, the fourth longest since 1951, had brought in only just over 6.2 million tons—it was clear that the 1970 target was unattainable. Earlier notes of caution from domestic and foreign experts had already been ignored (Hagelberg and Alvarez, 2006:130). This and other flights of Castro into economic irrationality can perhaps be explained by an unwillingness to countenance the prospect a relatively prosperous Cuba existing within the orbit of the United States, and the consequent need to seize every opportunity to mobilize the population to forestall such a future—a course of action in which he certainly was greatly assisted by the hostility of successive US administrations. At least one observer has put the convulsive mass mobilizations for the 1970 sugar harvest in the context of “the political articulation of the Castro regime” (de Diego Romero 2003:169). 3. To be sure, wild projections of production capability, based on flawed statistics, have not been adumbrated only in Havana (cf. Sánchez, 2007). 4. In order to reflect the fall in labor productivity resulting from the combination of a full employment policy and reduced production in the Special Period, CEPAL calculated an “equivalent unemployment rate” that was far higher than the nominal rate. 5. By comparison, OECD member states had a standardized unemployment rate of 5.6% in 2007. 6. The failure to observe international norms does not always flatter the results. A source of confusion for many years has been Cuba’s use of the polarization ratio, P/96, rather than the formula of the intergovernmental International Sugar Organization, (2P-100)/92, where P = degrees of polarization as tested by polariscope, to convert commercial sugars of different polarization to the common raw value basis of 96 degrees. For more than 50 years, Cuban raw sugars have on average registered above 97 degrees, and application of the polarization ratio in place of the conversion factor of the ISO (of which Cuba is a member), understates the reported output, unless corrected. 7. There is room for skepticism regarding the extent to which a regime wedded to the current Cuban model of socialism is capable of expeditiously effectuating reforms that depend for their success on large numbers of people acting rationally in concert. Despite the avowed urgency of making food production and marketing more efficient, for instance, a Granma reportage on the last-Sunday-of-each-month farm product fair in the Plaza de la Revolución in Havana in May 2008 (Pagés and Siberia García, 2008) highlighted the same incongruities— lack of scales to weigh the produce, confusion over rules and practices, price inelasticity, and so on—that were exposed in a series of Granma articles more than two years before (Hagelberg and Alvarez, 2007)—with the additional wrinkle this time that bananas brought some 900 kilometers by road from Guantánamo and remaining unsold at the top price that made the trip worthwhile were carried back to Cuba’s easternmost province because the capital’s state agricultural markets that might have taken them were closed on Sundays. 8. Interestingly, Guevara (1961), while accepting that “exceptions exist which give the Cuban Revolution its peculiar characteristics,” rejected the claims of exceptionalism then made for it. 9. This is a myth that Cuba shares with other tropical and subtropical countries. “You can throw anything into this earth and it grows,” claimed a Ugandan entrepreneur, echoing the widespread belief in the productiveness of tropical soils (Financial Times Uganda Special Report, 20 November 2007, p. 4). 10. For Valdés Mesa there were two reasons to elevate the economic culture of the workers: to make them conscious of being the “owners of the means of production and of the wealth created,” something evidently not fully achieved in the almost half century since Cuba was declared a socialist republic, and to combat “wrong concepts” and “bad habits”—the perennially denounced indisciplinas indicative of the lure of market forces.